Savory Restaurant is located to the right. It is not shown on the photo. This means that I already came full circle (360 degrees)! But my photo-tour doesn't end at Savory. Let us take the final walk along Quintin Paredes Street. By the way, before we continue please take another look at the above photo. Can you see the weird dome that have a lightning rod? That dome always reminds me of the helmet of Kaiser Wilhelm of Germany. Quintin Paredes Street stretches from the north end of Jones Bridge to Reina Regente Street. It is the road used by people who want to reach the Binondo Chinatown and Divisoria. This is the Filipino – Chinese Friendship Arch. It marks the “boundary” of the Binondo District. To its left is the old but beautiful building occupied by Philtrust Bank. I always imagine this arch being manned by archers. I pretend to be rained with arrows while I cross Jones Bridge. But the pitiful bowmen are no match to my horde for they met their death when I reached their arch. Ha! (Ooops...I was carried away by daydreams (Ok back to the photo-tour)). The arch is obviously part of the Chinese culture. This arch also serves as a mark to a heritage that took root in Binondo since the beginning of the Philippines. Chinese merchants had a flourishing trade with the Filipinos during the Spanish Colonial Period. Many of these merchants decided to settle down in Manila. The government authorities gave them the area on the north bank of Pasig River, which is now called as Binondo. Thus, Binondo became the center of Chinese culture in the Philippines. Calle Rosario is the original name of this street. Quintin Paredes is a politician who became a representative of Abra, a Filipino resident commissioner in America during the American Colonial Period, solicitor general and Senate president after the Second World War. Only few pre-World War 2 buildings remain along Quintin Paredes Street. Some were destroyed during the War. Others gave way to high rise buildings. The beige-colored building in the photo is possibly a pre-World War 2 building. The columns at its front and some decorations belong to that period. A lot of Chinese restaurants can be found along Quintin Paredes Street. The restaurant where I had eaten Hainan chicken can be found along this street. 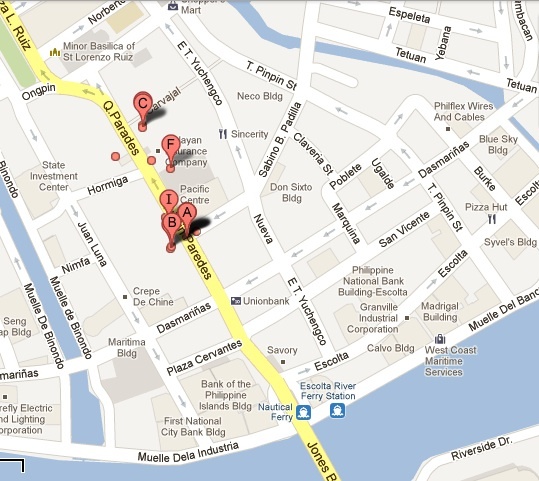 Quintin Paredes Street is the direct way to Binondo Church. That monument was erected in honor of Roman Ongpin. Roman Ongpin was an official during the Spanish Colonial Period with the title, Teniente Primero de Mestizos. He caught the ire of the colonial government when he collaborated with the Propaganda Movement and joined the rebellion against the Spanish government. Ongpin Street, which passes through the center of Binondo Chinatown, is also named in his honor. That ends my Manila photo-tour. I will continue my photo-tour when I return home from Thailand. I will try to capture the scenes of Ongpin Street and other areas of historical Manila. But if you really want to see a piece of Ongpin Street please read my post about Chinese New Year in Binondo Chinatown. Please click on this link to read my other posts about Manila. Information about Quintin Paredes was obtained from the Office of the Solicitor General website. Do you have any comments about my photo-tour? Don't keep those comments to yourself. Share it to us by submitting a comment through the combox below. Ang tagal na nun Parekoy ah. Isang dekada na ang nakararaan. Sayang nga. Sana, one time eh makapagsimba ka sa Binondo Church. wow! it's like you're taking me with you with these photos. naglakad ka lang talaga? sure? hehehe or me ride ka tapos stop ka lang para mag pciture? Naglakad lang talaga ako. Wala kasi akong car or kahit motorcycle man lang. :-P Ang importante dito ay ang aking handy camera. Dami ko natututuhan sa mga pino post mo ha! thanks for sharing! You are welcome po, Ate Anney. Its sad. Marami kasing Pilipino ang hindi marunang magpahalaga sa cultural heritage. Kaya iyan, nasisira na lang hanggang sa mawala.